SEOUL -- Hyundai Motor and Kia Motors said they expect 4 percent sales growth in 2018, suggesting a slow recovery from a slump linked to their lack of SUVs in the U.S. and diplomatic tensions with China. "The market environment is expected to be difficult due to a slowdown in major markets like the U.S. and China, prolonged low growth in the global economy and trade protectionism in major countries,” Hyundai said in a statement. Sales slumped 7 percent last year from 2016, falling well short of the group's target of 8.25 million vehicles and marking its third consecutive annual miss, as buyers in China and the U.S. increasingly shunned sedans for SUVs. A diplomatic row between China and South Korea over Seoul's deployment of a U.S. missile defense system also hit the brand's sales in the world's biggest auto market, although two countries recently agreed to normalize ties. 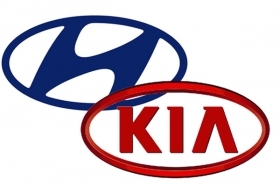 "This year's target for Hyundai and Kia is lower than expected. It seems to be a conservative target, reflecting a slow recovery in China and ongoing U.S difficulties," Kim Jin-woo, an analyst at Korea Investment & Securities said. The expiration of a tax cut on small-engine cars in China also would be a negative for Hyundai's sedan-heavy lineup, the automaker said. Hyundai Motor Group chairman Chung Mong-koo said in a statement the company would "actively venture into" new markets like Southeast Asia, as protectionism was expected to grow elsewhere. South Korea and the U.S. will hold talks on a trade deal on Jan. 5 although U.S. President Donald Trump has threatened to withdraw from the pact.